Martha Chase Doll shown is a pre-1920s Martha Chase cloth stockinet doll with jointed elbows and knees, hand painted facial features, stuffed with cotton. Made by Especially Trained Workers. ca. 1920s Martha Chase Child doll, 16" tall, cloth stockinet doll stuffed with cotton, with hand painted facial features and a bobbed hair style (popular during this era). 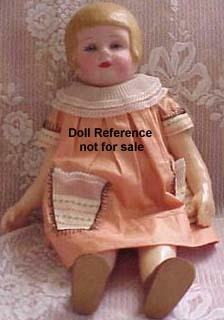 Dolls made in the 1930s are characterized by painted hair with a side part. Some Martha Chase doll names; 1921 Alice In Wonderland doll. ca. 1930s Martha Chase Hospital Doll,, 25" tall, these later dolls do not have the jointed elbows or knees. 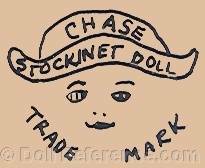 The stamp will now read "Chase Hospital Doll". 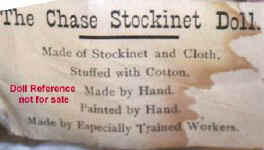 See above shown Stockinette label. ca. 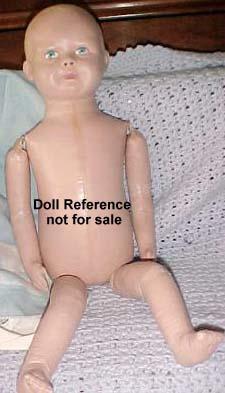 1920s Martha Chase Hospital Doll, 25"